This bowl was sitting on my sister's table waiting to be filled for a family dinner. I thought it was beautiful the way the light from the window shined on it. This is a mixed media piece. 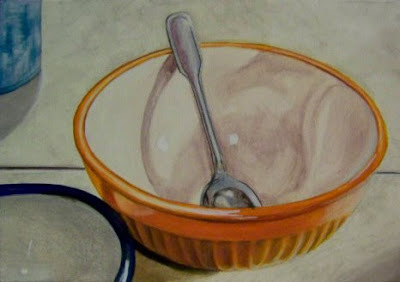 It is color pencils blended with mineral spirits, ink and acrylic and measures 5x7.